After a week of blazing hot sun, Percy Main’s game against Swalwell on Saturday only just got the go-ahead after sterling work by ground staff and players ensured the pitch was playable due to heavy overnight rain. Captain Mark Armstrong was without in-form trio of Andrew Green, Phil Cramman and James Stanistreet so called up equally in-form Jonathan Prested, Steve Patterson and Barry Errington as he attempted to topple the league leaders. After a delayed start, Main won the toss and immediately inserted Swalwell, hoping to make use of the damp conditions. This resulted in the perfect start as the dangerous Anderson was caught at cover by Phillips off the bowling of Stewart for a duck. Welch and the imperious Hewison quickly followed to give Main a great start and left the visitors reeling at 30-3. Dave Anderson and Richie Walker with the wickets. However, Whitfield and Innes, who was the main destroyer in the first meeting, then put on a good stand of 70 to repair the innings. Whitfield was then dismissed by Anderson, who had him caught at slip. Innes then cut loose on some wayward Main bowling as he moved to 62 before he holed out to Patterson. A late flurry by Smith helped Swalwell reach 175-7 of their alloted 37 overs. Anderson, Walker and Armstrong picking up further wickets. In reply, Percy Main never got going as former player and now nemesis, Guy Saxton, led from the front with an excellent spell of seam bowling on a pitch that got trickier as the game progressed. His efforts only returned one wicket though as Main stuttered to 121-7. Michael Boyd the only player to pass 20. The result left the home side in fifth place and they have another daunting fixture at Shotley Bridge up next. The second team, decimated by players being unavailable due to holiday, work or first team commitments, were defeated at lowly Seaton Burn. 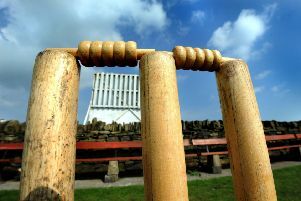 Only Tony Robson and Ben Jenkins made significant contributions with the bat, with 32 and 20, as Main could only muster 101 all out against Seaton Burn’s 121-9. Thankfully results elsewhere meant that Main maintained their healthy lead at the top of B2 as all the chasing pack also lost. This weekend is Percy Main’s Beer Festival, where there will be ten different types of real ale and four different ciders, all locally produced. Saturday has a free bouncy castle and face painting for kids who are with a paying adult. Tickets are £8 in advance or £10 on the day. Contact Steve Patterson on 07949 334699 for tickets or attend the club direct.